My wife and I are rowers who train on Lake Union in the heart of Seattle, Washington. This urban lake is often a chaotic dance of human-powered craft, sailboats, powerboats, and floatplanes. Having to turn around to look over the bow is disruptive to our rowing rhythm and makes it difficult to see directly ahead. Even with a bicycle mirror it is hard to keep track of everything that is going on around us. 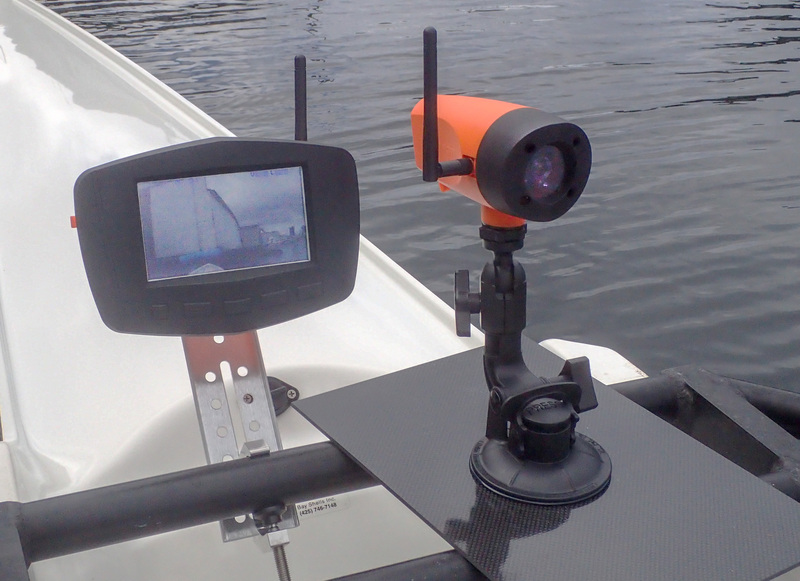 The author used optional mounts: the monitor mount instead of the rail mount for the monitor and the tall mount (for better visibility over the bow) for the camera instead of the flush mount. When I discovered Hyndsight Vision Systems online, I purchased two of their Cruz wireless camera systems. The system is composed of a monitor, camera, two antennas, two chargers, a monitor mount, camera mount, cleaning cloth, and manual, all packed in a custom-fit foam-lined case. There is a range of optional accessories for mounting; we added the tall mounts so the cameras sit high enough to see over the cockpit splashguard. Hyndsight claims a operating range of 1,760′ between camera and monitor; the best I observed was a distance of 1,500’, more than enough for my uses. The manual states that a full battery charge on both units will provide 4 to 5 hours continuous use. This did not disappoint; my test showed 5 hours to signal loss. Interestingly the camera battery-level indicator displayed no bars after 2 hours and turned red after 3-1/4 hours, but the camera continued on for another 1 hour, 45 minutes. The monitor and camera will float and are rated IP65, water-resistant; the manufacturer notes: “They can withstand short term, accidental submersion up to 2′ and are not recommended for underwater use.” While both units do float, they don’t have much reserve buoyancy, and if they go in the drink with any kind of additional attachments they would sink. A tether would then be in order. I checked the camera for submersion, holding it about 12″ deep for 10 minutes, and found no signs of leaking. The system is simple and easy to use, and the only setup is an initial pairing of camera and monitor. On a really sunny day, it loses contrast but is still usable. With a little overcast or clouds the monitor is bright and easy to see. The ability to mirror the image is really nice, so what you see on one side of the monitor is the side the object is on. The author tried both the tight-angle camera (its image shown on the monitor on the left), which is standard with the Cruz kit, but opted for the standard-angle camera (image shown on the monitor on the right). Hyndsight makes three cameras: a tight-angle (23º), a standard-angle (45º), and a wide-angle (95º). 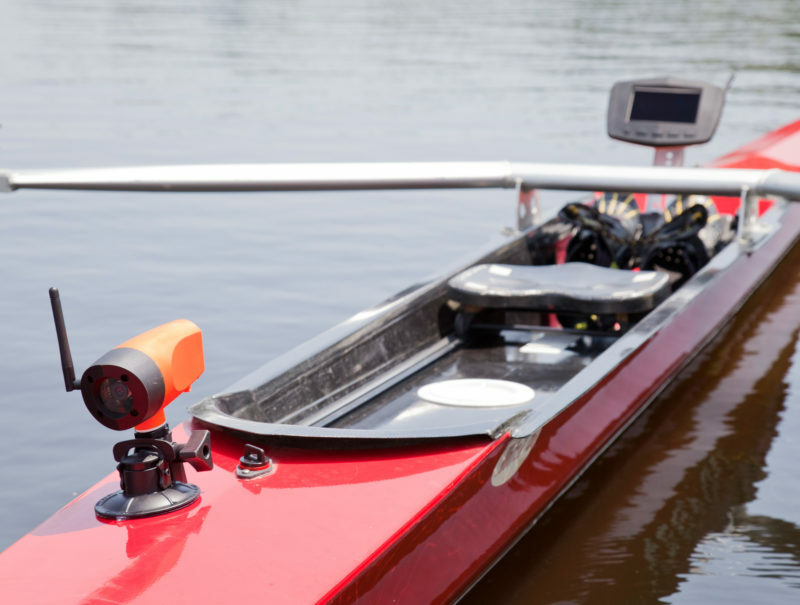 The Cruz comes with the tight-angle camera, Hyndsight’s recommended camera for rowing. For rowing on a river or someplace not as busy as Lake Union, it would be an excellent choice. Hyndsight kindly sent us a standard-angle camera to try, and my wife and I agree that it gives us a much better view ahead. 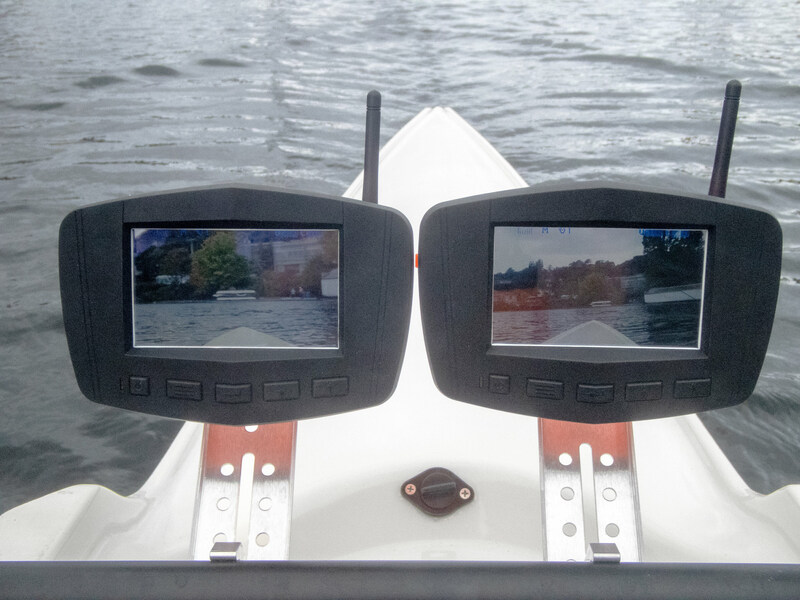 You can request either the tight- or standard-angle when ordering the Cruz system; Hyndsight advises against using the wide-angle for rowing. The Cruz kit comes with a flush mount for the camera. If the suction-cup base isn’t appropriate for a particular installation, other mounts are available. While we use the Cruz system for rowing, it could be useful for lots of things: backing a trailer, hitching up to a trailer, monitoring a load in a trailer, or watching a child in the backseat. We cartop our 32′ double shell on our 16′-long car; there is a lot of boat behind me that I can’t see while I’m driving, and the Cruz can fill in that blind spot. It is a joy to use and has become part of our standard rowing kit. Bill Bowden is a Mechanical Engineer living in Seattle. 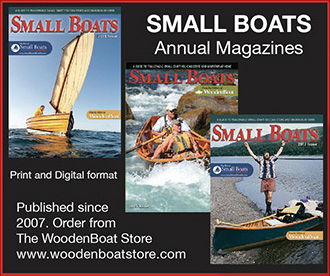 Rowing keeps him fit, connects him to the water, and has led to friendships around the world. The Cruz kit, $499, is available from Hyndsight Vision Systems and from selected retailers. I must say this seems a bit of tech overkill. I use a Take a Look biking mirror, which attaches to sunglasses or a baseball-cap bill. It takes about three minutes to get used to using it, after which it works flawlessly for seeing where you’re rowing. Turn your head a fraction and you can scan to horizon for hazards or new routes. Costs about $12 delivered.